Imperial Settlers has two major forms of expansions that it regularly releases. Previously I had featured the Atlanteans expansion, which is an example of one of their big box expansions that adds a new faction to the game every time. But before that, they actually first released smaller expansions they call Empire Packs. 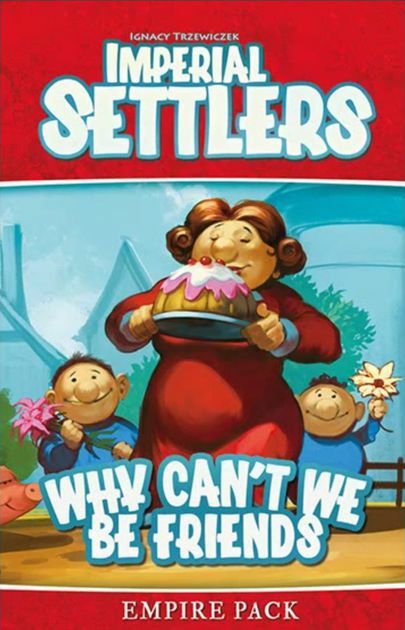 Why Can't We Be Friends is the first official expansion of Imperial Settlers and the first Empire Pack for the game. It adds over 100 new cards to the game and introduces additional rules for what has become to be known as "standard play" for the game in terms of how to assemble faction decks. This game features one of my favorite game mechanics and one that I think I enjoy the most versus the other Empire Packs that have followed this one. Or maybe it's just the easiest one to ease into and the easiest to teach to others and so its adoption rate is higher versus some of the other expansions and their quirkier mechanics. Imperial Settlers: Why Can't We Be Friends is the first Empire Pack expansion for Imperial Settlers and also designed by the base game's creator Ignacy Trzewiczek of Portal Games. The game includes new common and faction cards and enhancements for the solo play mode of the game. The main new effect introduced by this expansion is Open Production, which is a quirky card feature. When you have an Open Production card, you still get the production yield as normal during your production phase. But in addition to this, other players can allocate a meeple to your Open Production card to get the declared resource. But in exchange you get an additional meeple resource added to your faction board. Each Open Production card can be used twice during round. Hence the friends reference in the title - the new mechanic is enough to get you trying to "share" benefits with your competitors in order to harvest additional people for your own efforts. And you know how meeples can be universally useful in the game for a variety of actions. What I Liked: Open Production cards are brilliant and almost universally useful. It never feels wrong to play an Open Production card, even if it means that opponents might gain benefits as well. And more often than not you'll be able to find a use for those extra meeples to help advance your faction in the game. I also rather appreciated the detail of how additional faction cards meant taking existing faction cards out of the deck in order to maintain game balance. It can be an annoying detail as you do need to sort your cards and figure out which ones you can swap out in order to play. But the fact that it's up to the player helps keep games unique every time. What Could Have Been Better: This first expanion, especially older printings, can be annoying due to the lack of a clear indicator of it being from an expansion. Sure each card is individually numbered but that serial code is not a practical way of sorting the cards. But if you're going to play with this clever expansion, you'll need to master sorting your cards based on those tiny numbers. The new common cards weren't quite as thematic apart from the common Open Production cards. I wanted more but we didn't quite that and it's sort of okay but a bit of a downer. Given majority of this expansion consists of new common cards, it can nag a bit. 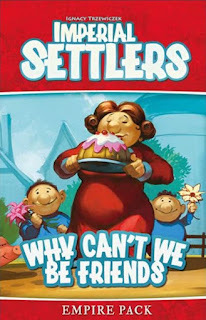 TL;DR: Imperial Settlers: Why Can't We Be Friends is a fun little expansion despite its deceptively small size. It being so compact makes it all the more impressive for how it nicely shifts the game dynamic. Thus it gets a great 4 ways the factions try to support one another out of a possible 5.